Throughout the "Storytelling Magic" posts I will make many references to the world I have created for my current work in progress. Any information about that world that you need to know will be kept here, including a map and pronunciation guide. Airaloth - Blonde-haired, light-eyed, elf-like, magic-wielding creatures that invaded Ruavaen when their own homeland was destroyed. They settled in the grassy, fertile heartland (pink cities) and drove out the previous inhabitants, the Nyvern. The Airaloth cursed the Nyvern so that the Nyvern could not stand light, making them easy targets if the Nyvern ever tried to attack the Airaloth. Nyvern - A general term for the natives of Ruavaen that were driven out by the Airaloth. This isn't a homogenous species but rather a term used to describe those people who are now grey-skinned, light-vulnerable, and living underground in the Vania Peninsula. 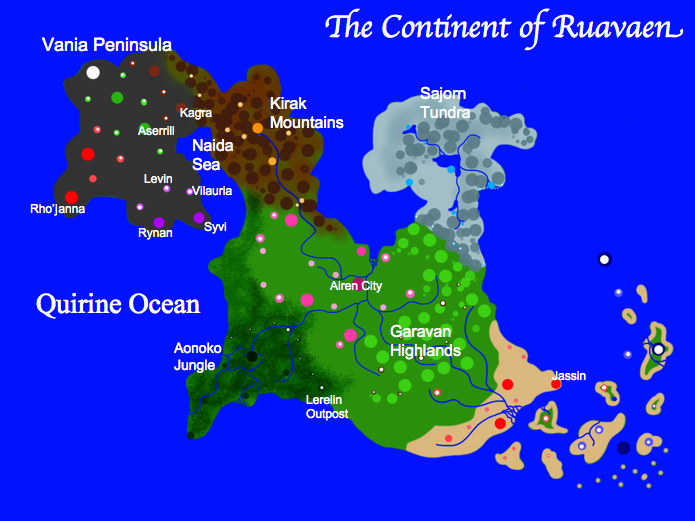 The red, green, white, and brown cities represent the locations of the different Nyvern kingdoms. They cannot use magic. Nyloth - A small group of people who are hybrids between the Airaloth and Nyvern. They share the Nyvern exile, weakness to light, and inability to use magic, but are still shunned because of their obvious Airaloth heritage. These people have just two cities in the Vania Peninsula: Rynan and Syvi. Trapped between their Nyvern enemies and the Naida Sea, they are in danger of being overrun.